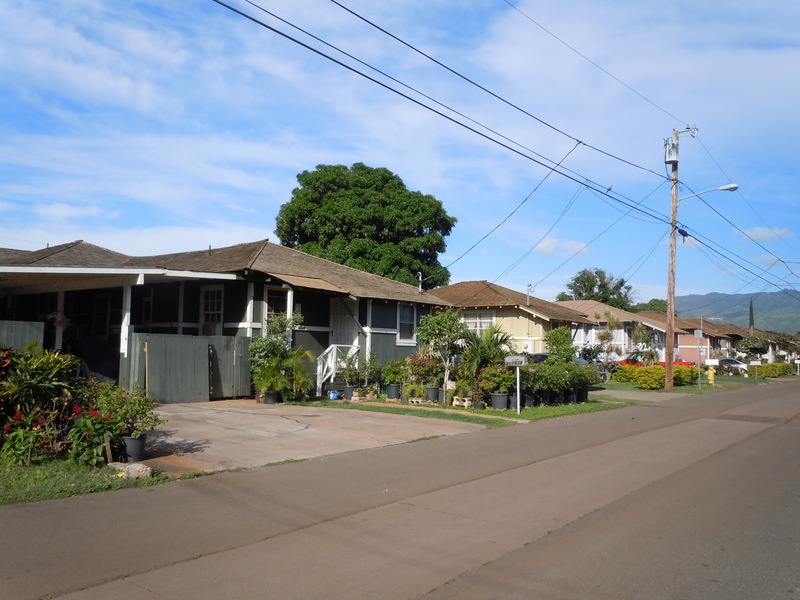 Though the plantation life started out as backbreaking, non-rewarding and exploitative for many of the workers desperately hoping for a better way of life, in Ewa, it eventually became a community where workers and their families enjoyed being. The power of the plantation made major inroads on Hawaii’s economy. But though it made Americans rich it did nothing for many Hawaiians who lost their way of life and land. The melting pot that is now Hawaii is due to the bringing in of people from Portugal, Korea, China, Japan and the Philippines among other places to work on the sugar plantations. At first it was a very hard life it eventually turned for the better for those who managed to stick it out. This post is about the improvements that were made on one particular plantation. The Ewa sugar plantation. The Ewa Plantation became a self-contained community where you worked shopped, lived worshiped, went to school and if time allowed, you played. Workers were given all the amenities they needed to keep themselves and families healthy. Ewa was noted for all the strides that were made towards fair and just treatment to their workers. 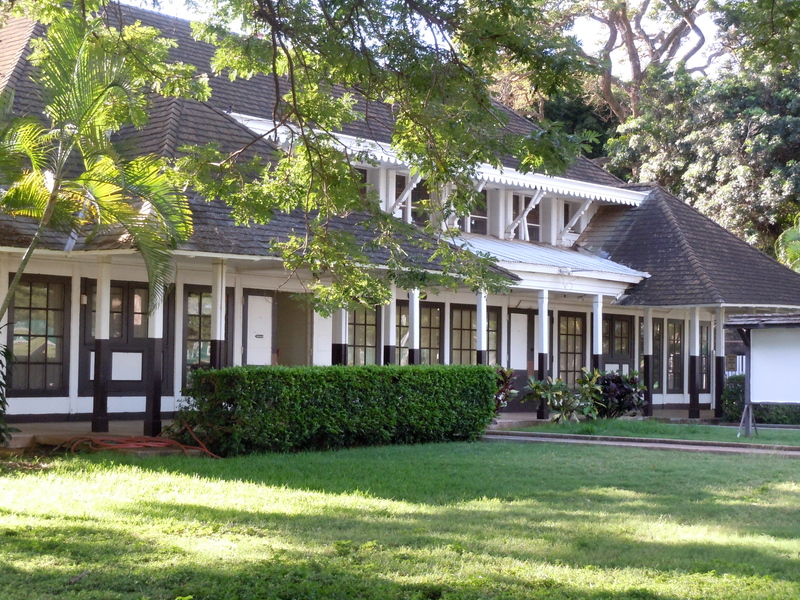 The designs of Hart Wood’s administration building and William Furer’s plantation store are prime examples of what today is known as “Hawaiian Style”. 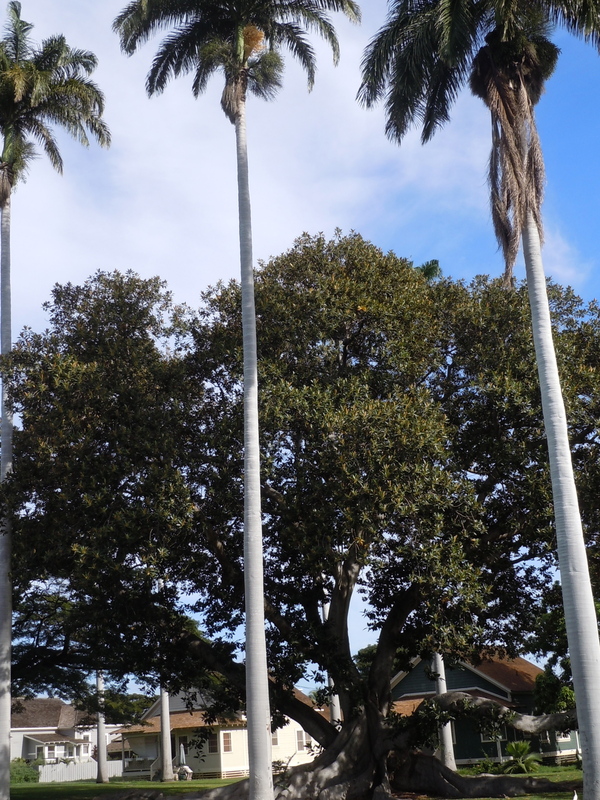 Hierarchical structure is seen along Renton Road where the village starts beginning with the Managers mansion to the supervisors and Doctors residence including clubhouse, tennis courts and swimming pool. (seems things haven’t changed to much.) And last but far from least came the plantation workers homes leading to the plantation itself. But Lowrie persevered going from the crowded living conditions of workers, that was common, to establishing profit-sharing and financial rewards for workers which helped stabilize the force. The last year before he retired he had a record crop to his credit and had established a kindergarten. The Hawaiian Railway at one point in time almost circled the island. 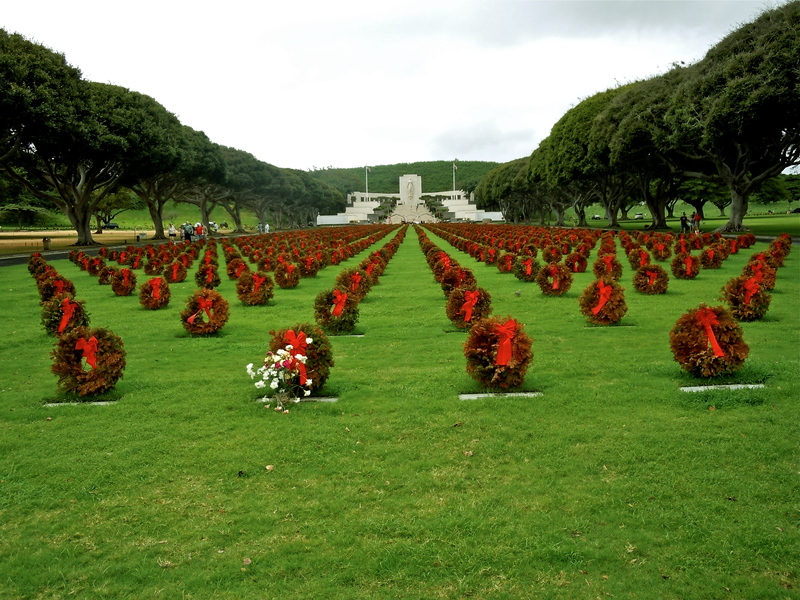 It served in many capacities including transporting soldiers from Honolulu to their bases during the first world war. But it was also very important in transporting sugar from the various plantations throughout the island. 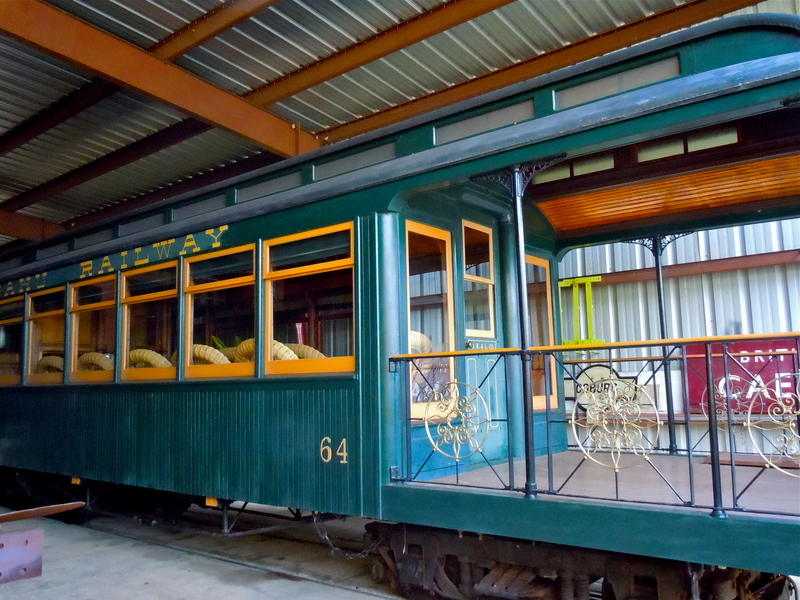 This particular car here was the private car of Benjamin Dillingham who started the railway system. Though small these were quite palatial as opposed to how the workers once lived. Japanese Club house. It is now the Friendship Bible Church. 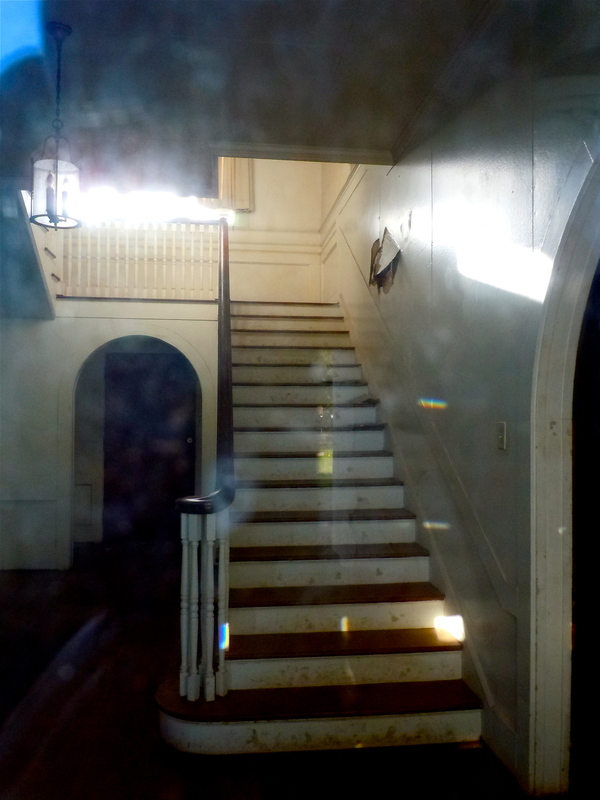 Built in 1935 it was a community center for plays, dances, and weddings and weekly showings of Japanese language films. Where are the graves? Only one lonely marker. 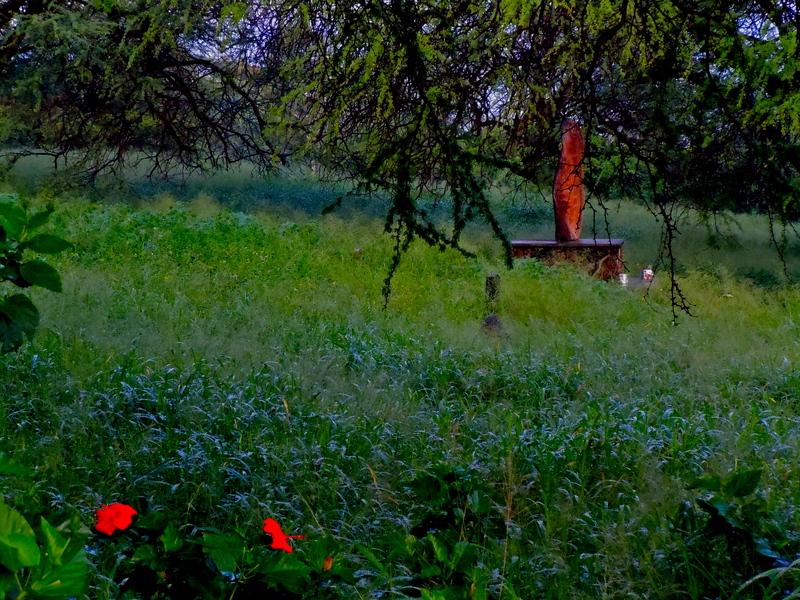 As many of you may have seen already, this is the Plantation grave yard. It was built close to the community so that friends and relatives would be able to visit it without having to travel far. It’s been at least a year that I’ve had these photos waiting in the wings to put into a blog. There is so much information on this community that I sort of felt overwhelmed for a while. If you enjoy walking, this community is a joy to meander through. Many of these Historic buildings though still maintaining their integrity have been turned into other uses such as a private school. 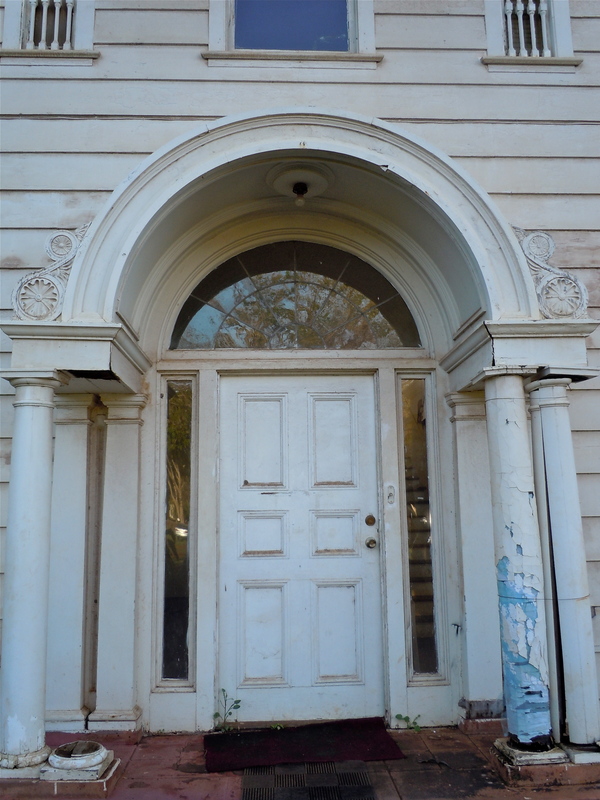 Money is still needed to restore the Managers mansion and I’ve heard that maybe once done it might be rented out for weddings and other celebrations. For those of you who have asked me to take photos of their ancestors graves, I’ve not forgotten. I have since found out that I might be able to get name and plot numbers and location of those plots at the Bishop Museum. That will take a while as the museum is currently understaffed in the archives so I don’t know when I’ll be able to get an appointment for that, but rest assured I will. Was there a hospital there around 1960 for people in the military? I don’t know if there was one at the plantation. 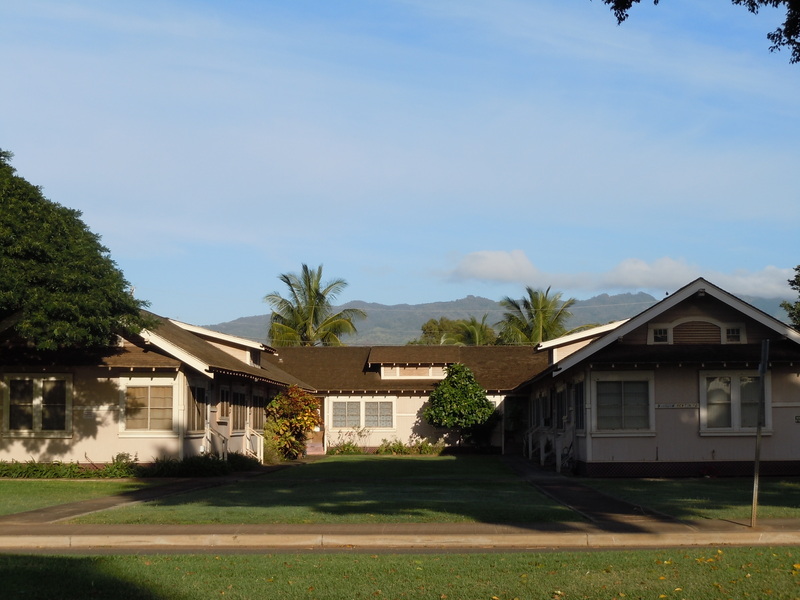 But there was and still is a military hospital on Oahu called Tripler. 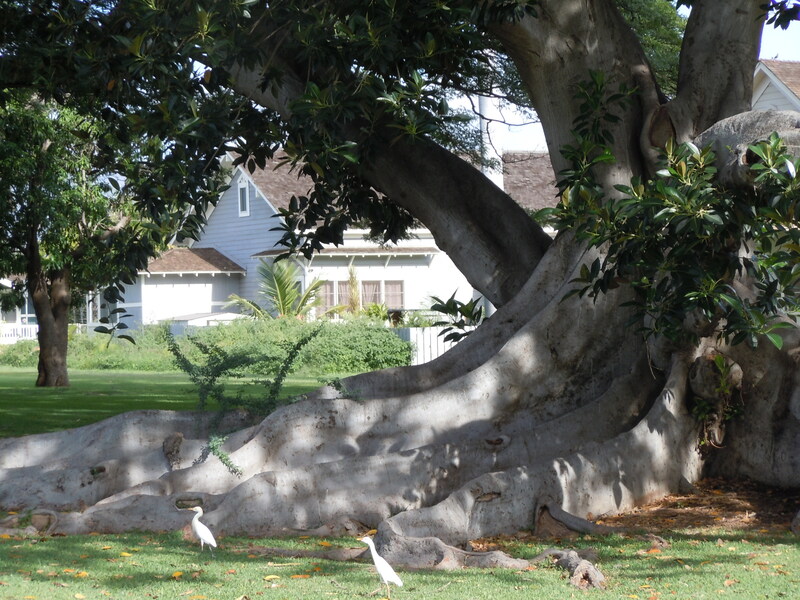 Karen – I loved seeing your photos and learning a little about the Ewa Plantation. Like Linda Ariza-Cooper, one side of my great grandparents came from Malaga, Spain to Hawaii in 1907 on the Heliopolis to work the plantations. (The other side came in 1912 on the Harpalion out of Gibraltar.) All of my grandparents were children when they made the voyage, and both families went to San Francisco and then settled in San Leandro. I’ve been enchanted with my family’s immigration story, and I’m just now trying to research all the details and capture them. I’m not sure where they actually were in Hawaii. One of my relatives mentioned in an old cassette tape “Ewa,” and that led me to find this blog post! It’s the only clue I have. ** I’ll try reaching out to Linda, since we have the same story! I’m wondering how she confirmed where her family was; I hear it’s near impossible to do. I’d love to connect with anyone who has the same Spanish immigration story, or anyone who has done research to uncover what plantations their family worked. Hi Jackie, interesting to read your comment. My Maternal ancestors came from Spain and settled in Mexico then up to New Mexico and then Colorado. My parents moved to California from there. I am the only one who went on to Hawaii. And here I’ve been for 52 years now. I hope you and Linda can connect. Thank you for stopping by my so neglected blog. During and after WWIi the Japanese Clubhouse was used as a USO Club. Local Japanese offered it to the Organization. My mother-in-law, Faith Sheldon, was the Director and it was very popular with the enlisted men from Ewa Marine Base and Barber’s Point naval Base. I lived in Renton Village with my husband from 1948 until 1960. I’ve read many a story about the different entertainment and recreation centers and also about the knitting during World War II. I would have loved to have lived in that village. Have you seen it lately? It is just beautiful it really is fun to walk through. Thank you for your comment I really enjoyed reading it. Fascinating stuff and an important part of our history. I had known more about cane in the the Caribbean than in Hawaii. Lordie, if we weren’t out right using slaves to do our work we aped our European forefathers and moved in, took over and exploited native peoples through exploitation and starvation wages. I am uncomfortable about that, but it looks as though the man behind this plantation realized those were human beings working for him. I wary of the phrase self-contained community for many coal mining towns were self-contained and miners were caught in a downward spiral as their wages could often not meet what was owed to the Company Store. I hope it was all for the good for past workers here. I just saw a movie on Netflix, Picture Bride, it made me aware of the Japanese immigrants in Hawaii. The plot was centered on a young Japanese woman of some importance but no money in her home so she became a picture bride and immigrated to the cane fields of Hawaii. It put me in the fields. It also had me counting my blessings. I really enjoyed picture bride. It was such a good movie. My daughter and I like to read about the immigrants that came to Hawaii. They are such interesting stories. But movies are always a joy to watch. It was a different manager and more recent times when the workers were treated better. Unfortunately in earlier times these people too owed there souls to the company store. The Japanese and Chinese were hard workers and very smart with their money. Even though they worked under adverse conditions they set their sail to get out of the fields and start their own businesses. Many of them became quit wealthy through their hard work and determination. Many of their business lasted up until recent times. The Plantation Management office 1935 picture is actually Ewa Store. 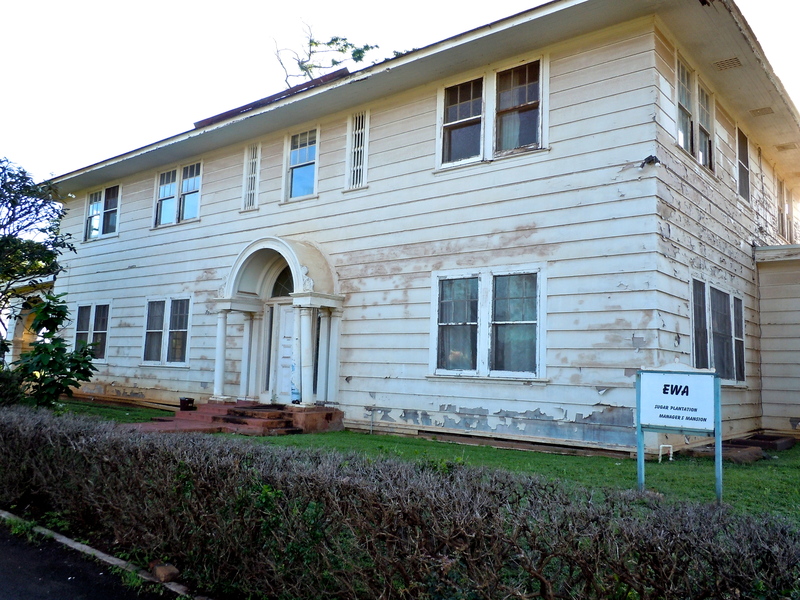 The building you are not sure of was the Ewa Plantation offices. My father worked for Ewa Plantation from 1945 until 1970 when it closed. My father was the Assistant Manger of Ewa Plantation and my uncle was the office manager. We lived in the doctor’s home from 1945 until 1963 when we moved into the Asst. Manager’s home. Jay, please forgive me for not replying sooner. Thank you so much for all of this information. It is so hard to get the correct information sometimes. At the museum when we give tours I always preface anything I say with, “This is what I have read or this is what I have heard” because there are so many versions of the same story. But I always appreciate it when someone who is connected can help me out. I’ve been waiting to update my blog. I’ve not had money to pay for extra photos and I’ve run out of space. I like to do photos as I know the readers so enjoy seeing what is being talked about. I will be updating as soon as I get things in order and hope to hear more from my readers with any information they may want to add. I so loved your pictures-thanks for sharing. Both sets of my great grandparents came from Spain and I have recently found out one set the Villena (on records was spelled Bellina) family who arrived in 1907 was working on this plantation. Found out my grandmother was born here. You are so lucky to get that information. I know that on my mothers side they came from Spain but it was so far back, I think to the 1500’s that I can trace it. Just don’t have the time. Thank you taking the time to check out my blog and for your comment. See my other post on this blog. My family history is like yours! Both sides came from Spain to Hawaii and then to the Bay Area. I thought both sides came on the Heliopolis in 1907, but recently discovered (through the Family Research Center, LDS) that one half actually came in 1912 on the Harpalion from Gibraltar. It sounds like you’ve been researching. I’m just starting the journey. I’d love to connect with you and learn from your experience! Please reply if you’re willing to chat and share notes. Gracias! Loved these photos and great to see so many amazing buildings still standing in the place where my grandfather was born. 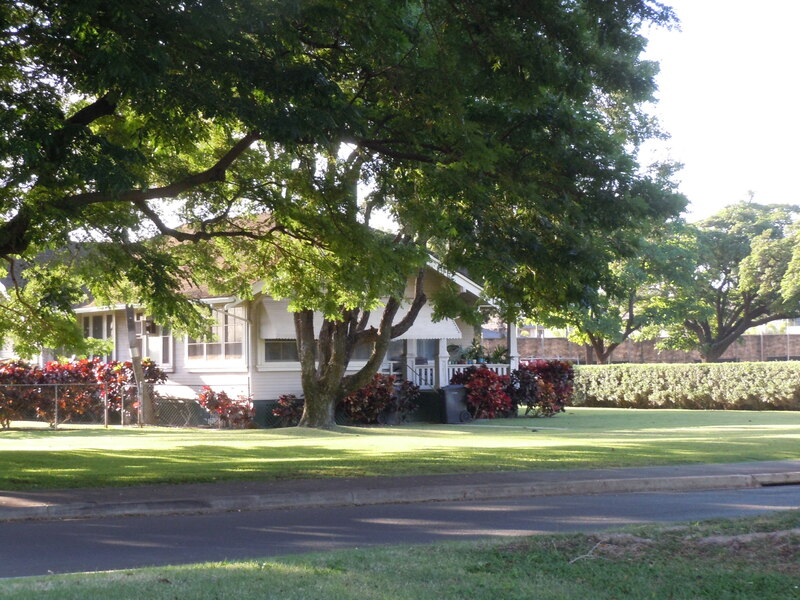 His mother, 3 sisters and my great great grandparents lived on Ewa Plantation. My great great grandmother was one of the first group of Puerto Ricans who came over in March of 1901 to Hawaii to work on the plantations and finally settled in Ewa around 1904. I see you mentioned that the Bishop museum has information on the plots and graves for Ewa Plantation. I am desperately trying to find where my 3 times great grandmother Eduviges was buried as she made the long journey from Puerto Rico to Hawaii in 1901 at age of 72 and as far as I know she was still alive in 1910 as we have her on a census record but have no idea where she is buried or what year she passed. Do you think Bishop Museum would help me try to locate this information. Also is there any sort of Ewa Plantation museum to go to? I haven’t been since I was about 7 and we are planning on a trip this June so would love to go back. Thank you in advance! You can also go to the Ewa Community Cemetery site and check to see if your great gradparents are listed. Also there is an old timer Simon Nasario still alive today, you can find his album at this site and you can contact hime also for information. Many thanks for posting the photos and bringing to life the special place that I grew up. I’m so thankful that you have included Ewa Plantation Town in your blog. I remember Ewa Shopping Basket. 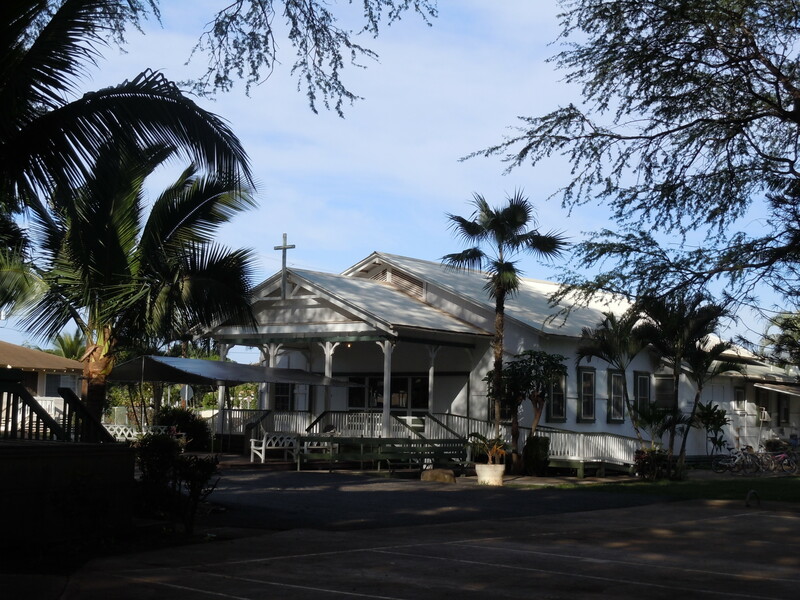 My brother attended Lanakila Baptist School. Would love to learn more about the place’s history. And thank you for looking in Agnes. I love that area and with all the improvements that have been made it is a pleasure to walk through the neighborhood. Alas, I’ve not been doing anything but knitting. I just can’t seem to put my needles down. Especially now that I’m learning to knit socks. But my blog is always on my mind. It sounds as though you were living in Ewa after the renovation of the plantation houses. Exactly what would be of interest to you? I’ll be going back as they are finishing up on the renovation of the managers Mansion. Got to get some photos. Thanks for stopping by. The photo you’ve labeled “Plantation Management Office 1935” was actually the Ewa Plantation Store, a classic general company store. When I worked there as a bagboy in the early 1980’s it was known as the “Ewa Shopping Basket”, if I recall correctly. It now serves as a Preschool. Twice a week the senior town residents would come in and do their shopping, leaving their groceries boxed up for me to deliver to their homes after school. I used to know the town pretty well. 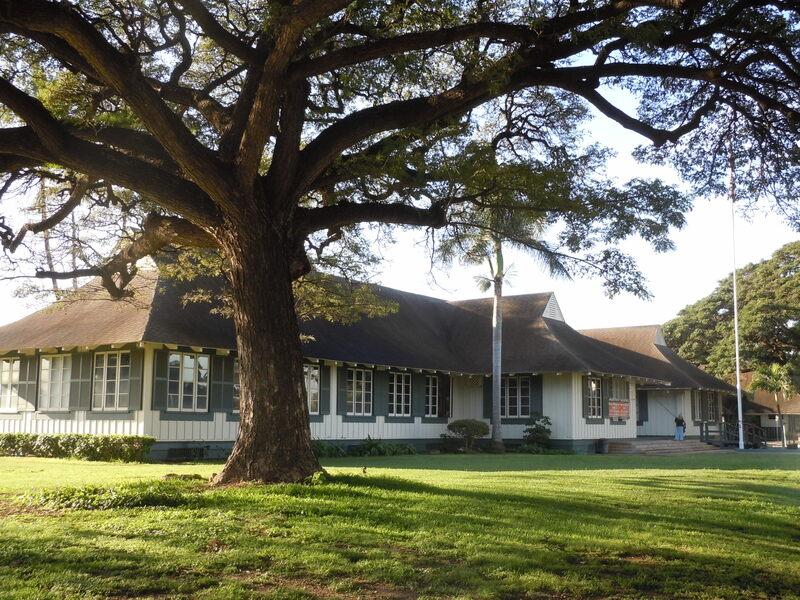 The next unknown photo was actually the Plantation Management Office, now serving as Lanakila Baptist High School where I attended through 1981. I spent many hours there assisting in the transition from office building to school facilities and was the first janitor for the school there. There is in fact a large vault on the main floor, and a very large vault for file storage underground. There’s also a dumb waiter to access attic storage. Thank you so much for that information. I had taken all these notes when I walked through the town and then promptly lost them. I was hoping I could find the information but to match the photos to the description was not easy to do. I was hoping that someone like yourself would be able to fill me in. Great information. My grandmother came to Hawaii from Norway, in the late 1800’s. She was around two at the time. Her uncle’s last name was Ferguson, and he was a forman at the sugar factory. 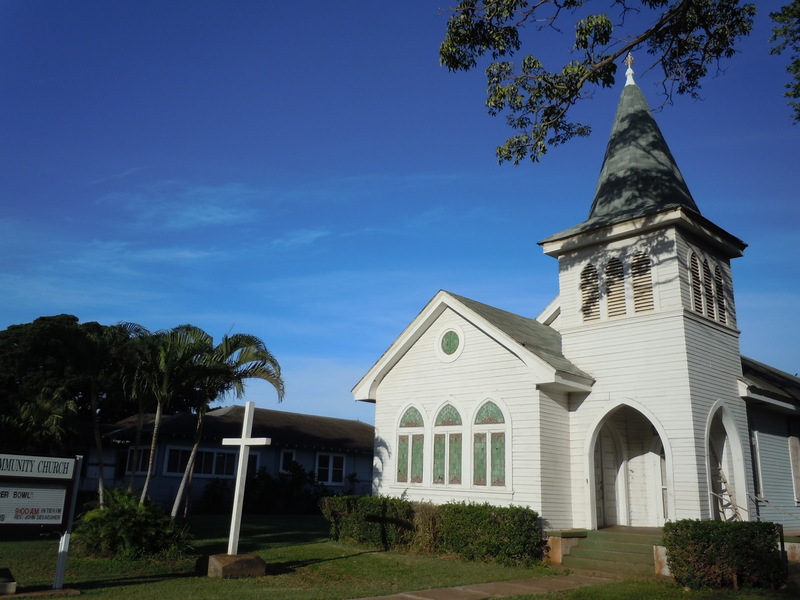 She lived during the week in Honolulu at the Catholic Church, which her uncle helped to build. 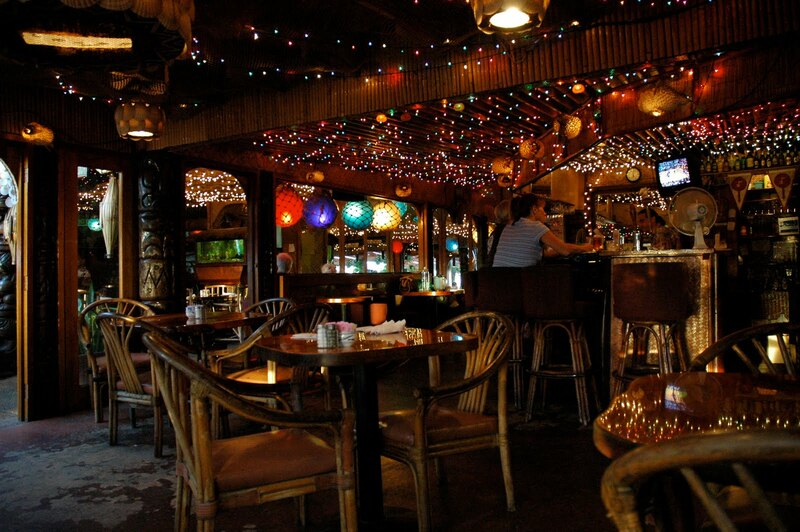 When she was a teenager, they came to California, where they had a ranch called, The Aloha Ranch. I would love to find out more information about her life here in Hawaii, as she often told me, this was her favorite place on earth. She went blind early on, and my fondest memory of her was her always sitting by the sea, just to hear the waves. Carol, being that your great grandparents were white ( and I don’t mean this in a derogatory way) he would have worked in a managerial position and probably would have had a nice house to live in maybe even one of those I posted in the article. I find it very interesting that your grandmother had to stay in town at the catholic church to be educated. To find out more about your grandmother would mean you having to do a lot of digging into your genealogy. The Mormon church has tons of history on line and you might want to start there. We’ve been trying to do research on my kids side of the family here in Hawaii and it is quite hard. But being that your ancestors were connected to the sugar industry you might have an easier time of it. You might even want to start at the catholic church that your grandmother attended. I wonder if she was at Cathedral of Our Lady of Peace in downtown Honolulu. I read something that said it is quite beautiful during the Holidays with it’s decoration. Maybe I will try to get down there and see if I can get some photos. If there happens to be any priest around (which there usually isn’t as it usually only opens for service) I will do some inquiries if I can. The building which you didn’t know what it was used to be the main store and bank of the Ewa Plantation Company. There is one extremely large safe and a vault underground. Thank you Christian for that information. Have you seen the vault? Boy I would love to be able to go underground and check it out. Thank you for the comment and taking the time to check out the blog. Your post is opening in an interesting way Hawaiian history. I love Your photos which complete the story very well. I saw this “Japanese Club house”. I ask that is it the same than we Finns have here and there all over the world “club houses”. I mean that there has / is yet a Japanese community who founded Club house for their use. In Brazil, in the town of Resende and more precisely in Penedo, there is very active Finn club which is open for everybody and on Saturdays plenty of people come even from Rio de Janeiro to dance Finnish old traditional dances. Was that Japanese club something like that? There are many types of Japanese organizations here in the islands. The one I wrote about was a place where the Japanese plantation workers got together with other Japanese workers to watch movies and entertain themselves. They might have formed groups to pull monetary resources to eventually buy businesses or land too. The Japanese have managed to keep their culture alive to this day with the many clubs and organizations that perpetuate their way of life. Unlike other immigrants that came to Hawaii, that blended into the Hawaiian life style, the Japanese held on to their ways that they new when they lived in Japan and passed it down through the generations.